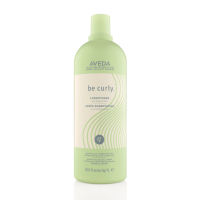 Aveda Be Curly Conditioner is part of the 4-step curling perfecting system that will dramatically reduce frizz and define your curls. The wheat protein and organic aloe blend will expand when your hair is wet and retract when your hair is dry, enhancing your curl or wave. With a refreshing citrus aroma with certified organic lime, lemon, bergamot, orange and other pure plant and flower essences, this great product will leave your hair in fantastic condition. Massage into your scalp and hair after shampooing with Be Curly Shampoo. Rinse your hair as normal.